The whale shark season has been officially inaugurated last 1st. June, so we are very happy to invite you to live this wonderful experience. The Whale Shark can measure up to 40 feet and weigh 11 tons. We depart every day from Playa del Carmen around 5:00 am (approximate pick-up time since it depends on the location of your hotel) to be on time at the marina in Cancun located at the Hyatt Zyva hotel. We will leave very early towards the encounter with the Whale Sharks that is very close to Isla Contoy, which allows us to be the first to arrive at the area, before the rest of the boats. Upon reaching the area we will be ready to swim with the Whale Shark. Teams will be made of 2 people who will jump to swim for 10-15 minutes, when they finish they will return to the boat for another team of 2 people to enter the water. You can enter the water as many times as possible during the time of the activity, then go back to the marina. If you are interested in spending more time swimming with the majestic Whale Shark, we recommend you to buy a private tour. 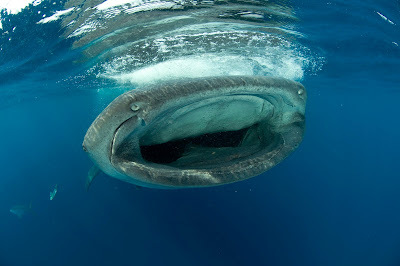 Keep at least 1 meter away from the Whale Shark and at least 4 meters away from the tail.